Board books are sturdy books for babies and young children which are made of strong, thick cardboard. They make great first books for babies because little ones can handle them as much as they like without tearing the pages or otherwise damaging the books too much. This is important because one of the reasons for reading to children is to foster a love of books and reading and it helps if babies are encouraged to handle books whenever they want to. So let them do it! You'll find that almost all of the best books for babies, toddlers and young children can be bought as board books as well as in the usual hard-cover and soft-cover versions. 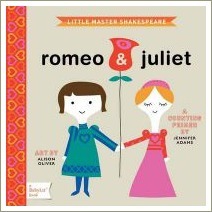 Board books make wonderful gifts for babies. You can give them to the mum-to-be as baby shower gifts or keep them to give to the new baby when he or she is born. they have sturdier pages which are easier for babies to turn by themselves - babies love this! 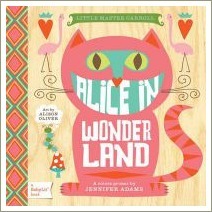 On this page you'll find my list of the 11 Best Board Books for babies and young children. 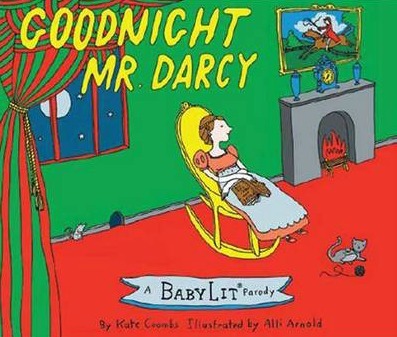 These are the classics: the books that have proven themselves over the years to be absolute, no-risk, sure-fire favourites with babies all over the world. Most book shops will stock these books but, if you prefer to shop online, they're also available at very good prices with free postage from the Book Depository, my favourite place to buy books these days. 1. The Very Hungry Caterpillar This is a modern classic. It makes a brilliant gift and is usually a great favourite with children for their first three years because it's simple yet there's a lot going on in it: counting, colours, animals, different foods, the life-cycle of a butterfly ... lots of fun and learning. You can read more about The Very Hungry Caterpillar, its author, Eric Carle, and why the book's so great to share with babies and young children here. 2. 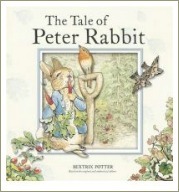 The Tale of Peter Rabbit This book probably doesn't need an introduction. 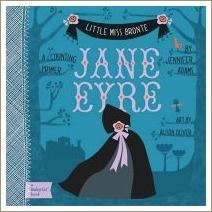 I loved this little book as a child and was thrilled when, many years later, my three children also loved it. In fact, my daughter loved it so much as a three-year-old her grandmother bought her a board book copy with a little handle which she carried around with her for several months. Apart from the fact that it's a great book, I think it's good for kids today to be introduced to the classics. 3. 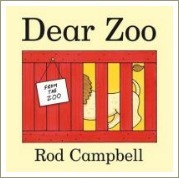 Dear Zoo Lift-the-flap books for toddlers are always popular and this is one of the cutest ones around. A little girl wants a pet so she writes to the zoo and asks them to send her one. The zoo sends a series of animals and your child gets to lift the flap and see what they've sent. Just when you think they'll never get it right, they send the very best, most perfect pet of all. 4. 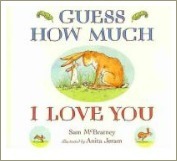 Guess How Much I love You This is a lovely story about a father rabbit saying goodnight to his son. It's a wonderful book to read to a baby or small child at bedtime and, if you start when the child is very tiny, the story will become a treasured part of his or her bedtime routine. This creates special memories for the child but it also becomes a clear signal, even to a baby, that 'it's sleep-time now.' This can calm the baby and help him settle down at nap-time or at night. What a bonus! 5. 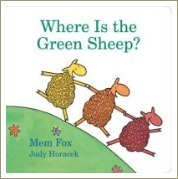 Where is the Green Sheep? 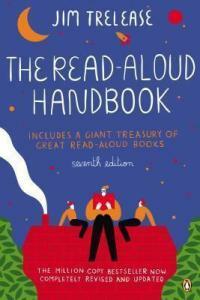 This was The Children's Book Council of Australia's 2005 Book of the Year: Early Childhood. The illustrations are hilarious and children love discovering the silly things the sheep get up to. 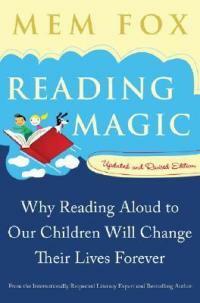 Mem Fox is an Australian author, literacy expert and passionate advocate of the importance of reading to children. 6. 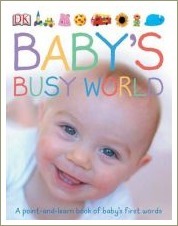 Baby's Busy World This book is filled with gorgeous photos of babies having fun doing everyday things - having a bath, playing, eating and so on. We had a book exactly like this when my children were small and it was a great favourite. For some reason babies love seeing photos of other babies and delight in recognising the things they see every day. They feel very clever when they can point to the things they recognise and you'll love seeing the excitement and delight on your baby's face as he turns each page. This book is great for naming all the things that are part of your baby's day, an activity that helps develop vocabulary and language skills. 7. 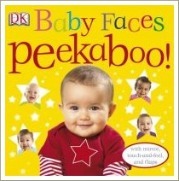 Baby Faces Peekaboo There are quite a few DK Publishing books on this page because the company does a great job with little books like this one. They recognise that babies love to look at photos of other babies and this book has the added attraction of being a lift-the-flap book. Under the flaps are all kinds of faces - happy babies, sad babies and many others, all waiting to say 'hello' to your baby! Very cute. 8. 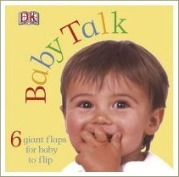 Baby Talk This is another book by DK Publishing with great photos of babies smiling and laughing. Again, it's a lift-the-flap book, which adds to the fun. Babies should be able to manipulate the flap with help from about the age of six months and on their own by their first birthday. The sense of discovery and 'I can do it by myself' which comes with these books is great for your baby's self-confidence. The fact that these are such short, easy-to-handle books makes them favourites with babies all over the world. 9. 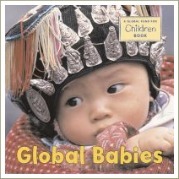 Global Babies This great little book contains photos of babies from all over the world in their home settings. The photos included are of babies in Guatemala, Thailand, Greenland, Mali, the US, India, South Africa, Fiji, Peru, Afghanistan, Malawi, Spain, Iraq, Rwanda, and Bhutan. A phrase of the text appears on each page and reads: 'Wherever they live, wherever they go, whatever they wear, whatever they feel, babies everywhere are beautiful, special, and loved. What a lovely book to give to a baby! 10. My First Word Touch and Feel This is another one of the great DK books about objects around the house. This is great for naming the things a baby sees every day, building vocabulary and recognition. One of the great things about these books is that they're fun to read with your baby but babies also love to look at them on their own. 11. 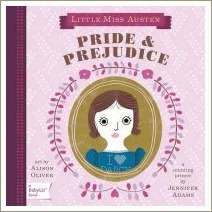 BabyLit Classic Board Books These little board books are just adorable. They're new so my own kids didn't have them but they'd make a great newborn baby gift or a wonderful gift for a baby shower, especially if the new mum is a reader. Three of the four are counting books while the fourth is an introduction to colours. The books are historically accurate with the most beautiful illustrations depicting key points and characters from each story. Of course, the books don't recount the stories in full but they do introduce the characters, images and parts of each story which littlies will remember when they eventually watch the films or read the novels. 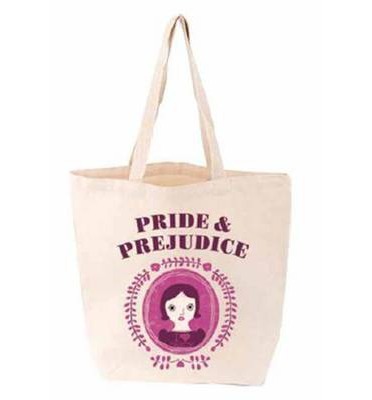 'Charming' is a word that isn't used very much these days but these books are utterly charming!